Andrew Stahl is an artist predominantly focusing on painting. He studied at the Slade School of Fine Art, UCL, England at both graduate and undergraduate level. 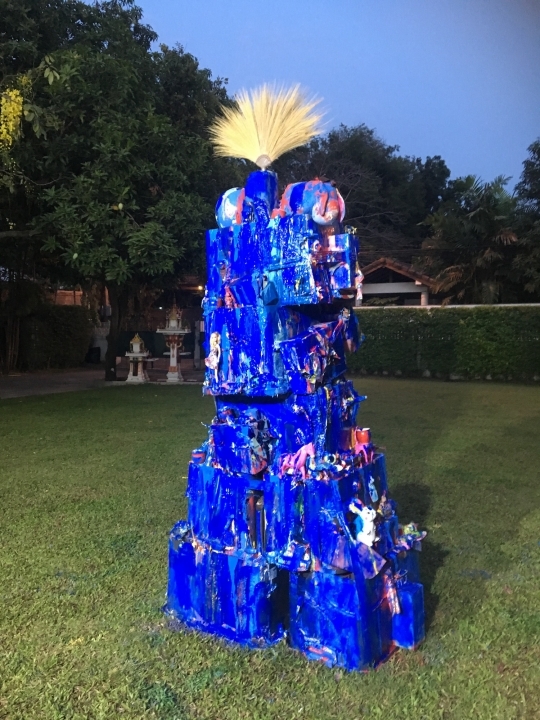 Andrew Stahl has exhibited extensively worldwide in solo and group exhibitions and recently in 2014 curated and participated in 'MD3 Fragility and Monumentality' at the Bangkok Art and Cultural Centre, a British Council funded exhibition including 12 Thai and British artists. He simultaneously had a two person show with Panya Vijinthanasarn at the Thavibu Gallery in Bangkok, Thailand called 'Conversations: The Vivid Real'. 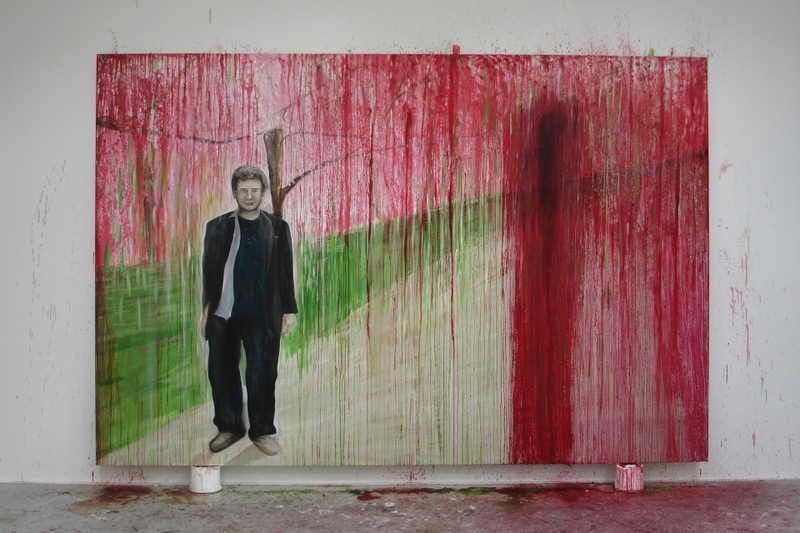 Other exhibitions include: 'New Paintings' at Robert Steele Gallery, New York (May 2010 and 2007); Parasol, Matthew Bown Gallery, London (2007); 'Painting of the Eighties' Matthew Bown Gallerie, Berlin (2009); 'New Painting', COFA with Ivan Docherty Gallery, University of New South Wales, Sydney, Australia (2004); 'Bangkok Mosaic' at 100 Tonson Gallery Bangkok (2003); 'New Paintings' Chiang Mai Museum; 'Neue Arbeiten' ac.t art, Zirndorf, Germany (2000); Andrew Stahl Fenderesky Gallery Belfast,(1999); 'New Paintings' Flowers East, London (1998); 'Cries and Whispers', New British Painting, British Council Exhibition touring Australia, Spain and South America (1988-96). Awards include the Abbey Rome Scholarship and the Wingate Scholarship. Andrew Stahl has participated in residencies in China, Thailand, Australia and Sri Lanka. His works are in many private and public collections including, the Metropolitan Museum of Art, New York, Arts Council England, the British Council, Government Art Collection and British Museum. My research focuses on contemporary art and painting in particular. Painting has a special fascination for me as it is so un-sensational –just mud on a surface. My recent research concerns the implications and the potential offered by the transcultural and globalisation for contemporary art. I believe art can be a complex and rich soup of different histories and traditions and the time we live in enables intercultural interaction and the creation of new discourses and germinations. I see international engagement as a vital part of contemporary practice. I have participated frequently in artists residencies at the invitation of the British Council and universities in China, Thailand, Australia and Sri Lanka, which have enabled me to consider and view different approaches to contemporary art. The Death of Trotsky' draws on multi-layered symbolic meanings. …. In this painting the snake is the assassin and both sudden death and desire. Desire, the physical and the intellect are often in a kind of dance and struggle. Though the painting provides this image from a distance, as you move closer to the painting small images are revealed. These little items do not add up to a story, they are mind wanderings, a collection of flowing thoughts floating across the surfaces, perhaps influenced by Chinese scrolls. I collect things such as green trees from Japanese noodle packets, items of decoration, images and body parts. Monologue Dialogue 4, Mysticism & Insecurity. The Monologue Dialogue series has grown from a British Council initiated and funded residency and exhibition in Bangkok, Thailand. From then onwards a series of exhibitions have taken place in Bangkok and London with an evolving and expanding group of participating artists. The last exhibition was in 2014 at the BACC (the Bangkok Art and Cultural Centre). The key focus for the artists has been to install or construct work in a space/gallery together and in some way to reflect on the transcultural nature of today’s discourse for artists. Opening on the 3rd of May 2017 at the Koppel Project Baker Street, MD4 continued with an expanded number of participating artists from Thailand, the UK, Bangladesh, China, and Japan. The participating artists were: Eric Bainbridge, Rana Begum, Tintin Cooper, Yvonne Feng, Miranda Housden, Neil Jeffries, Sansern Milindasuta, Atsuko Nakamura, Nipan Oranniwesna, Be Takerng Pattanopas, Tuksina Pipitkul, Nathaniel Rackowe, Andrew Stahl, Kai Syng Tan, Jedsada Tangtrakulwong, and Panya Vijinthanasarn. The exhibition was curated by Andrew Stahl, The title of the exhibition Mysticism and Insecurity can refer to perceptions of the mystical and magical nature of human life across all cultures; insecurity however can refer to the inability of art to fully express and realise these transcendent ideas for multiple reasons, primarily though because of the world’s materiality, because of materials being resistant, dragging against intentions even for the use of language, and symbolism. This resistance is what is most ecstatic and interesting, where the material itself whether it is paint, objects, performance or virtual media contains the magic and frailty of our existence by being resistant to manipulation. The one thing that unites us all is our materiality and a sense of ‘is-ness’. The exhibition was supported by UCL Global Engagement and the Thai Embassy in honour of King Bhumibol Adulyadej Rama IX. A visit by Andrew Stahl to Thailand in the 80’s as part of a British Council show initiated a fascination with Thailand. 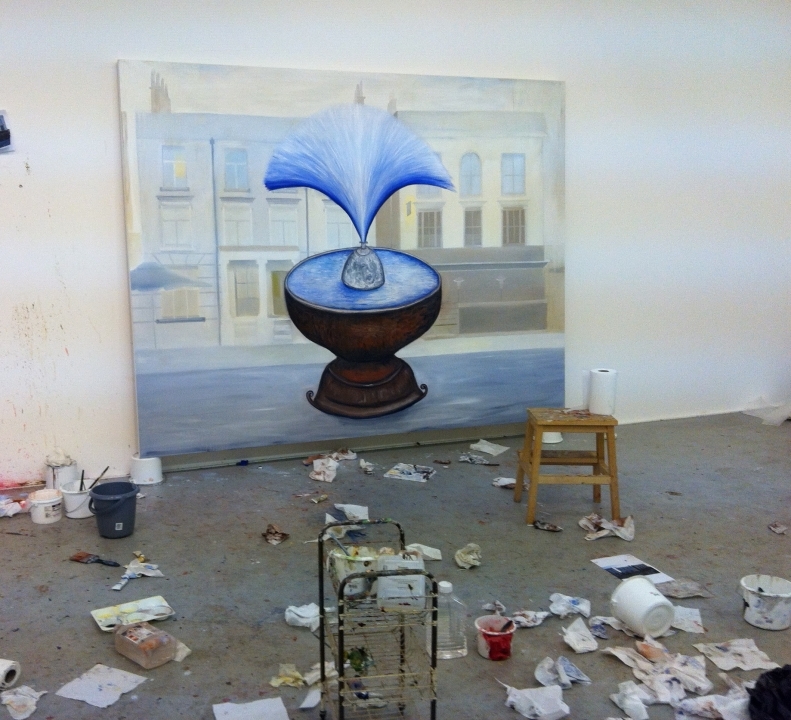 A number of artists’ residencies and exhibitions have followed in the intervening years. 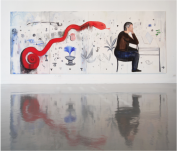 Andrew Stahl exhibition at YenakArt Villa: Hot Summer by the Klong exhibits his paintings made during a recent residency near Bangkok’s Chinatown where he spent a large part of the summer 2016. 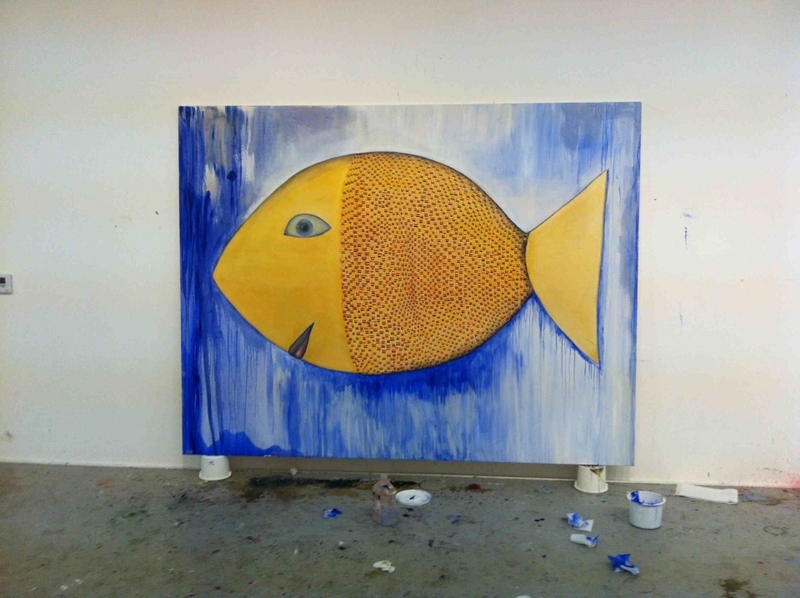 The paintings reflect on the experience, memories and thoughts of this time spent working intensely through the heat and travelling to the sea. They also reflect on a journey to Rome just before the summer, which revived his fascination with fountains as a source of surprise and joy. These paintings have a new fluidity and flow. Momentary visions, thoughts, memories and imaginations coalesce into a whirlwind of fragments held together by an overriding sense of euphoria at the beautiful country of Thailand. The intense energy of the city acts as a contrast to the expanse of blue that fills the horizons of the vision in the islands dipped in the sea. The exhibition consisted of both large and small works, drawings and a number of sculptures including one made on the lawn in the architecture garden of the gallery. This was a group exhibition curated by Paula de Ramos that took place in a house in Curitiba, Brazil which I participated in including the following artists: Kim Alexander, Lara Akinnawo, Nathalia Arduini, Camilla Bliss, Bea Bonafini, Eze Chimalio, Charlotte Chw, Juliana Coelho, Isabel Collins, Sophie Dixon, Cecilia Granara, Sérgio Gonçalves Jr., Phillip Raymond Goodman, Emily Harmer, Frank Harris, Lily Hawkes, Katja Heber, Miranda Housden, Summer Hung, Lara Jacoski, Stephen Kirin, Yane Kritski, Alexandre Linhares, Cassiana Maranha, Luisa Mazarotto, Alex McNamee, Diogo Messias, Liane Mestrinho, Jude Cowan Montague, Bruna Mush, Sissa Oliveira, Kaajel Patel, Miranda Pissarides, William Pham, Andreia Porto, Juliana Cristina Silva, Ayesha Singh, Isabelle Southwood, Andrew Stahl, Andrew Stys e Ana Tiene. Invited by Tess Jaray to contribute some paintings to the specially-curated main room of small paintings; one of my paintings is illustrated in the catalogue. A group show of 100 artists who make prints. This is a travelling show curated by Chutima Kerdpitak. Starting in London, it travelled to Spain and France, Thailand, Philadelphia, Holland, Suriname among others. This show looks at the boundaries between outsider art and mainstream practice. The exhibition was accompanied by a conference on the value of art education. Andrew Stahl was one of the main speakers. This exhibition was a 3-person exhibition curated by Brian Curtin at H Gallery, Bangkok, Thailand. The artists were Andrew Stahl, Thaiwijit Phuengkasemsomboon and Sujin Wattanawongchai. The show excites tensions and antagonisms for considerations of what contemporary painting practice is and does. Moving outward from purportedly traditional notions of painterly craft to vacillations between the intimate and the vulgar, the observed and the cerebral, art historical preoccupations and thoroughly contemporary experiments, 'Conflicts of Interest' seeks to highlight divisions rather than resolve them. This disunifying theme inquires into how, for example, the rhetoric of authentic expression can be reinvigorated by juxtaposition with the slapdash and ironic, without the latter losing potency. Further, painting’s vexed relationships to visual and material culture at large are acknowledged; between text and image; the streamlined and the visceral; the appropriated and the invented; the assimilated and disruptive; and form and formlessness. 'Conflicts of Interest' essentially takes a skewed look at conservative understandings of painterly methods and forms in order to provoke radical relationships and fresh perceptions. This exhibition was shown in three places. Firstly it opened in Wimbledon Space and then toured to Phoenix Gallery, Exeter followed by Charlie Smith Gallery in London. 'WhaTTo Dip' is the phonetic pronunciation of the Thai word meaning 'Raw Material'. I had 5 drawings in this group international exhibition in Thailand at Chiang Mai University Art Centre organised by Uncooked Culture. This exhibition contained 36 artists from 12 countries and was organised by Uncooked Culture founder Chutima Kerdpitak. Curated by Neville Gable, artist-in-residence at the Olympic Park. 'Unearthed' was an exhibition and archive which sought to reveal the cultural history of Carpenter's Road Studios which used to be on the site that the Olympic Aquatic Centre is placed in the Olympic Park Stratford. These studios were managed by Acme and were occupied by 500 artists between 1985 and 2001 including by Andrew Stahl. This was a two-person show with Panya Vijinthanasarn. 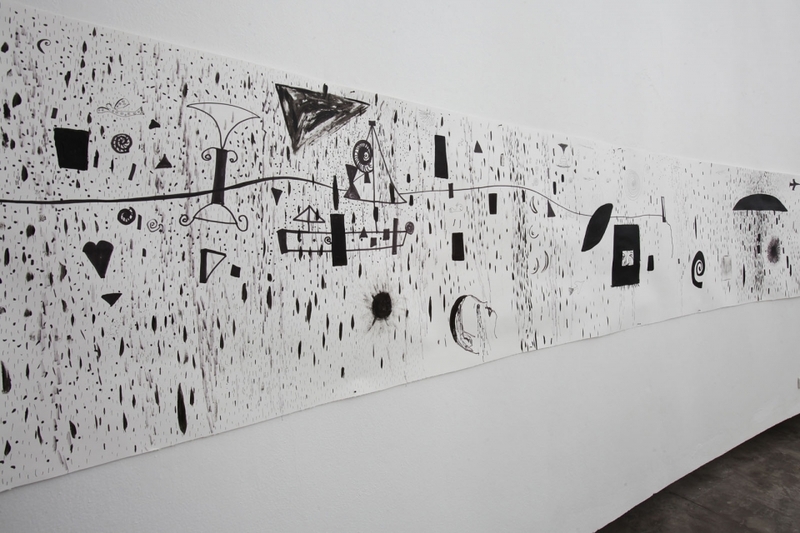 This exhibition continues the dialogue between Panya Vijinthanasarn and Andrew Stahl. Part of an annual invitation group exhibition to make a small work for Angela Flowers Gallery. Curated by Theresa Liang and William West. A group show of works on paper artists Andrew Stahl, Ray Atkins, Greig Bourgoyne, Stephen Finer, Roy Oxlade. This is the catalogue for Andrew Stahl's Solo Exhibition at YenakArt Villa. (2014) MD3 Fragility and Monumentality, Introduction to my painting 'Death of Trotsky' by Andrew Stahl. Bangkok Art and Cultural Centre (BACC). (2014) 'Conversations: The Vivid Real' - Thavibu Gallery, Bangkok, Thailand. Catalogue introduction by Andrew Stahl. (2014) 'MD3 Fragility and Monumentality' Catalogue introduction to whole exhibition by Andrew Stahl. Bangkok Art and Cultural Centre (BACC). (2013) Not Another Art Project. Introductory paragraph on own work by Andrew Stahl.The Barefoot Gallery, Colombo, Sri Lanka. (2011) WhaTTo Dip. Paragraph on own work by Andrew Stahl. Chiang Mai University Art Centre, Thailand. (2011) Chaminda Gamage, 'New Paintings'. Catalogue introduction by Andrew Stahl. (2009) ANYWHERE ANYTIME ANYHOW. Catalogue introduction by Hassapop Tangmahamek. Ardel Gallery, Bangkok, Thailand. (2009) 'Whichwait', Nir Segal. Catalogue introduction by Andrew Stahl. (2008) Monologue/Dialogue 2. Catalogue introduction by Andrew Stahl. Bischoff/Weiss Gallery, London. (2008) Stew. Online introduction. 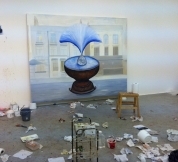 Artspace Gallery, London. (2008) Monologue/Dialogue 2. Essay on own work by Andrew Stahl. Bischoff/Weiss Gallery, London. (2006) 'Pricha Arjunka Paintings'. Catalogue introduction by Andrew Stahl. (2006) Monologue/Dialogue. Catalogue introduction by Ark Fongsmut. Bangkok University Gallery, Bangkok, Thailand. (2006) “Panya Vijinthanasarn & Andrew Stahl : Conversations, Collaborations and New Paintings”. Steven Pettifor Catalogue essay. (2005) 'Battle of the Titans', Tintin Cooper. Catalogue introduction by Andrew Stahl. (2004) 'Reflections', Breda Catherine Ennis. Catalogue introduction by Andrew Stahl. Pyramid Art Studio, the American University of Rome. (2003) New Paintings and Drawings: 'Bangkok Mosaic'. Catalogue introduction by Andrew Stahl. 100 Tonson Gallery, Bangkok, Thailand. (2002) New Paintings. Catalogue introduction by Andrew Stahl. Silpakorn University Gallery, Bangkok, Thailand. (2001) New Paintings and Drawings. Catalogue introduction by Andrew Stahl. Chiang Mai University Art Museum, Thailand. 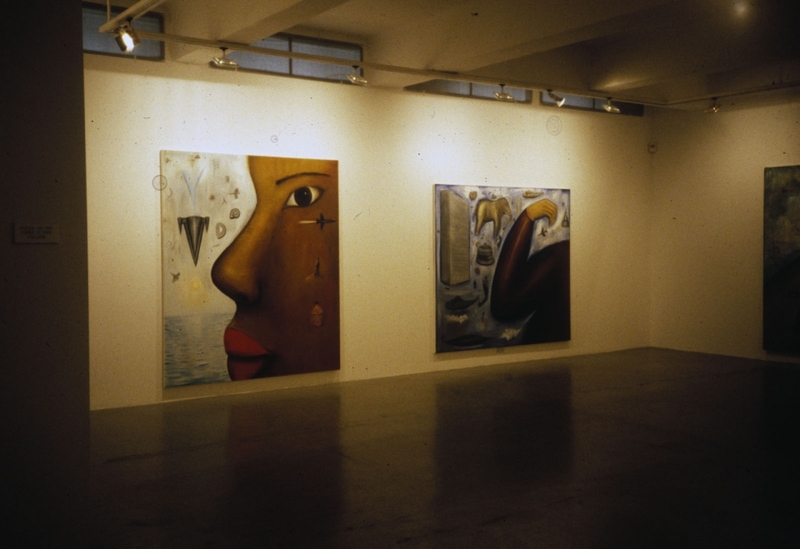 (1998) New Paintings, Flowers East, London. Catalogue introduction by Alberto de Lacerda, ‘Something Rich and Strange’. (1995) Andrew Stahl Paintings. Wolverhampton Art Gallery and Museum and Flowers East, London. Catalogue introduction by Stuart Morgan, ‘The Bearable Lightness of Being’. 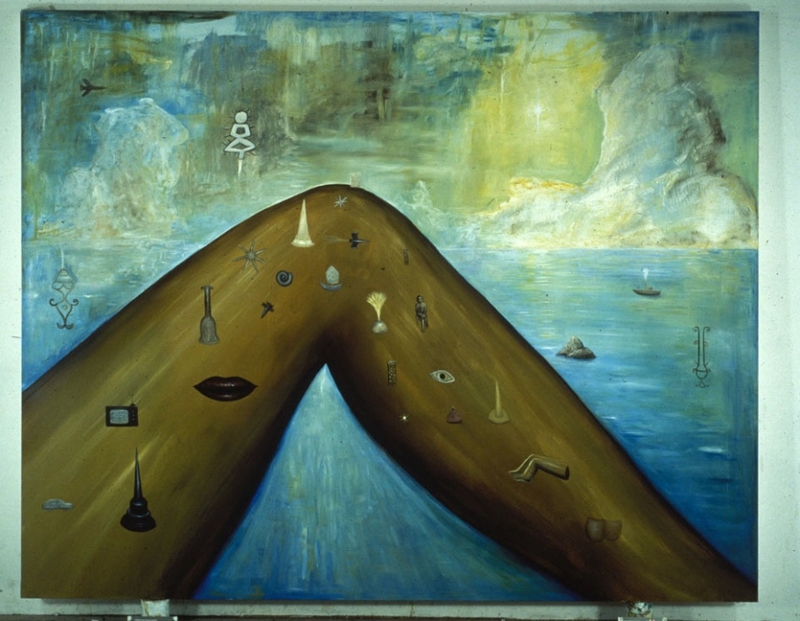 (1992) New Paintings. Catalogue introduction by Andrew Stahl. Flowers East, London. (1992) New Paintings, Flowers East, London. Catalogue introduction by Guy Brett, ‘Paintings by Andrew Stahl’. 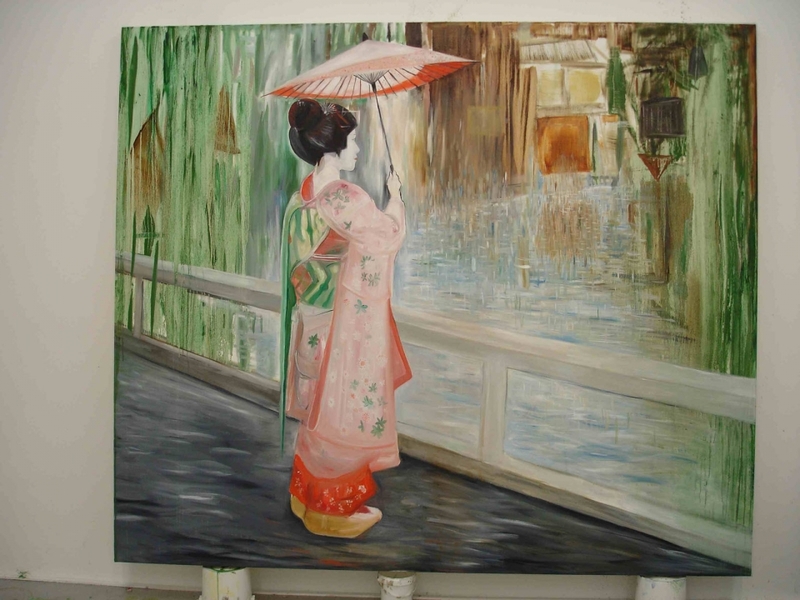 Sharon Kivland wrote this response to my paintings as a potential catalogue article. For British Council touring exhibition 'Cries and Whispers'. A brief mention in this online guide as follows: YenakArt Villa Another addition to Bangkok’s contemporary art scene in 2015 was the YenakArt Villa, also located in the fashionable Sathorn district. Founded by French entrepreneurs Frederic Meyer and Jeremy Opritesco, the gallery is housed in a sleek ‘Bauhaus’ style villa with a grand glass facade and sprawling sculpture garden. The villa hosts a wide range of visual exhibitions, from painting to light-art to fashion shows. Whilst the gallery focuses on promoting Thai artists to global audience, it also features international artists for several-week periods. In April and May of this year, the works of British painter Andrew Stahl – Professor of Fine Art at the renowned Slade School of Fine Art, London – were presented in the exhibition ‘Hot Summer by the Klong’; the pieces were influenced by Stahl’s visits to Thailand since the 1980s. From late October until early 2018, the gallery will host Thai artist Jirapat Tatsanasomboon, who is recognised for his marrying of traditional Asian imagery and Western pop culture.